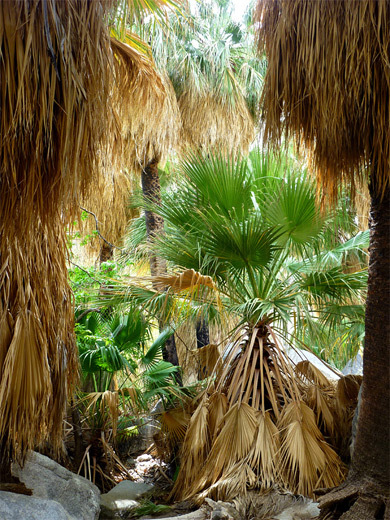 Most of the best hikes in Anza-Borrego Desert State Park are to cool, shady places like oases, slot canyons and groves of palm trees. 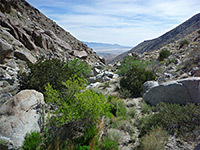 For the latter, the best known location is Borrego Palm Canyon, at the edge of San Ysidro Mountain near Borrego Springs, and there are several similar ravines nearby; another, also easily explored, is Hellhole Canyon, the next drainage south. The palms are found about one mile from the mouth of the canyon, which upstream (the South Fork) borders Culp Valley, a popular camping location alongside Hwy S22. 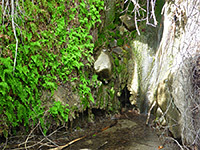 The enclosed part of the ravine is about 4 miles long and contains several groups of California fan palms, growing alongside a small stream, which flows below ground in some places, though forms permanent pools at others, and at one point tumbles 20 feet into a rocky grotto, lined by ferns (Maidenhair Falls). 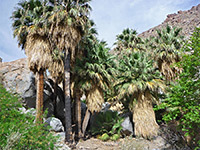 The falls, and the palm trees, can be seen by a hike of 2.5 miles, starting at a parking area along S22 just south of the state park visitor center; the path crosses open desert flats for a mile then runs along or close to the streambed. The route is easy enough but has a few rocky, steeper places when approaching the falls. Like most hikes hereabouts, the trail is not recommended for the summer months, due to the intense heat. Although the recognisable path stops at the falls, the canyon can be followed further, yet despite the drainage becoming steeper, with bigger boulders and denser patches of trees and bushes, there is no obvious reason for its ominous-sounding name. 19 views of Hellhole Canyon. 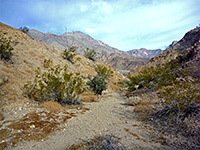 The trailhead for Hellhole Canyon lies at the foot of the steep and bendy section of S22, as the road descends from the mountains and levels out before entering the town of Borrego Springs. The visitor center is one mile north. There is plenty of parking space at the trailhead, plus an information board and map, though the location is not signed from the road and the hike is not much publicised by the state park service. Rules about primitive camping are very relaxed in the park, so overnight stays might be possible at the trailhead, but if not the closest location is 7 miles west along S22 in Culp Valley, or along nearby side tracks. One other short path starts from the Hellhole Canyon trailhead, following a shallow side valley southwards for a quarter of a mile, advertised as a good wildflower hike in the spring. The main route heads southwest, towards the mouth of the canyon, visible at the edge of the hills about one mile away. The land in the immediate vicinity is mostly flat, covered by bushes, cacti and ocotillo, and crossed by little dry drainage channels. The trail is wide, straight and easy to follow. It soon intersects the California Riding and Hiking Trail, which climbs the hills to the southwest and reaches Culp Valley in 4 miles, continuing westwards into Montezuma Valley. The Hellhole Canyon Trail traverses softer and sandier terrain, so walking is a bit more tiring, and passes through an extensive group of teddy bear cholla cacti. The hills to the north and south come slowly closer together as the canyon mouth approaches, and the path starts to climb very gently, with a firmer surface underfoot. It reaches then follows the main wash channel emerging from the canyon, crossing it several times. 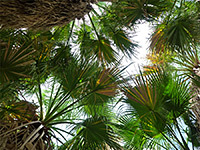 Palms appear quite soon; first three isolated trees and then a big group, in the middle of which are several cool, dark areas where overhanging fronds completely block all sunlight. 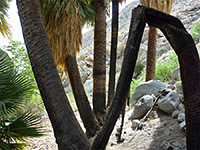 Some palms are fire damaged, while others bear a complete sheath of dead branches around the lower portion of the trunk, accumulated over many decades. A stream is soon flowing, creating little pools and cascades, and a tiny waterfall where the water flows down a groove in a boulder. Unusual (for a desert) wildflowers grow beside some of the pools, including seep spring monkeyflower and stream orchid. Beyond this first, extended group of palms is a short dry section, where the canyon becomes rockier and has more boulders to climb over, but the route is still quite straightforward, the path well traveled. The trail continues to another group of palms where the stream flows again, and reaches Maidenhair Falls, on the far side of the grove. Here, the water flows 20 feet over a streaked rock into a shallow pool, bordered on the far side by a ferny wall. More orchids grow at the base, up to 3 feet tall. The path seems to end here, on the north side of the stream, but the falls can be bypassed by climbing up through a gap in the rocks on the south side, briefly into a thicket of other trees, then back into the open. Ahead are more overgrown patches with just an occasional palm tree, and other exposed stretches. The stream now is generally wider, forming bigger pools, sometimes in the open, lined by thin belts of grass, in other places flowing through dense undergrowth, where walking is easiest little way up the canyon sides. The ravine is now more steeply sloping, so walking is significantly harder.